First of all, I didn’t receive this ebook copy of Shearwater in return for a review, but I received a notification from my email subscription of it and thought that the deed the author is doing for his book launch is for a good cause. 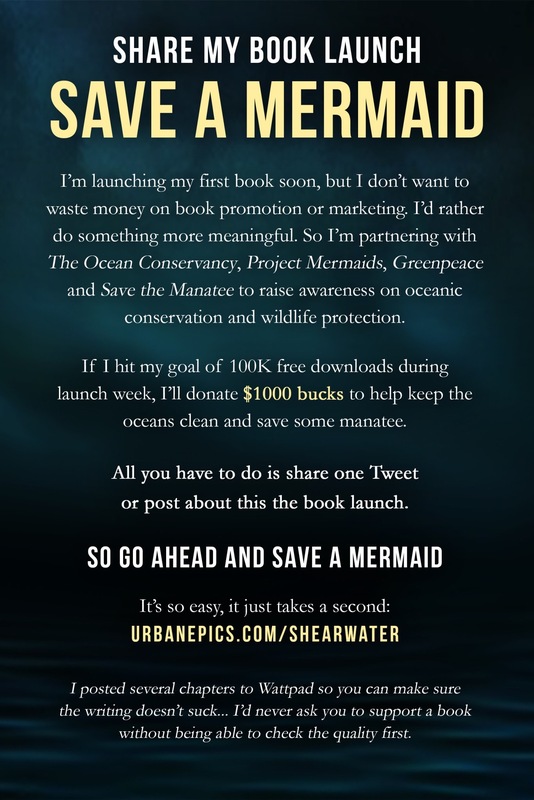 This is Part One of D.S Murphy’s first novel Shearwater – an epic YA mermaid romance, wanting to do something meaningful for his book launch: raise money for ocean conservancy and to protect marine wildlife. Shearwater is a Paranormal Fantasy novel that will appeal to lovers of paranormal romance, urban fantasy, witches, mermaids, mythology, and paranormal horror. After her parents die in a car accident, 15-year old Clara Clark is shipped off to live with a grandfather she never knew existed… in Ireland. Once there, she discovers that her mother’s past is filled with secrets. Determined to discover the truth about her mother, a string of strange incidents cause her to question her sanity. As the mystery deepens, she begins going through changes of her own, until she’s not sure just who – or what – she is anymore. Then she meets the charming Sebastian, who won’t leave her alone, and the brooding Ethan, who can’t stand to be around her. Both of them seem to have supernatural powers, and she’s not quite sure whether they want to kiss her or kill her. When a shocking revelation destroys everything she thought she knew, she’s forced to choose… whether to cling to the last of her humanity, or venture into the deep abyss in search of her true identity. I finished part one of Shearwater under a little less than 13 hours. I can’t believe it either! It’s just so good. Shearwater really allowed me to embrace the different emotions (of Clara) of grief, happiness and newness. There is enough mystery in this book to keep you keen but not make you confused. The prologue in Shearwater drew me to the characters and into the story. Even though I’m not really a huge fan of mythology, history and the sorts, I think those back stories really supports the credibility of Clara’s (main character) past. I’m going to be bold (see what I did there? XD) here and say that this might be one of my favourite reads in 2016. Who doesn’t love a good YA Romance? But who can resist a freaking combo of all good genres that can exist under the sun?! I would totally want a printed copy of this!! 😍 I can’t wait for the next part! Get the ebook copy of Shearwater when it releases here.